On January 31, 2019, the students and staff of Sacred Heart Catholic School gathered in the sanctuary of Sacred Heart Catholic Church to offer prayer, solidarity, and support of many local community service organizations and charitable organizations. Grade levels worked together to gather materials and funding in preparation for this event. 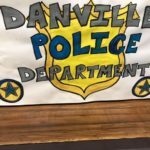 Preschool-Three and Preschool-Four provided notebooks and writing utensils for the Danville Police Department to use to collect information for their reports. 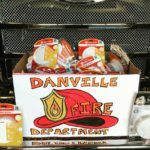 Kindergarten and First Grade raised money to purchase smoke alarms for the Danville Fire Department. 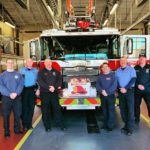 They donated more than thirty fire alarms to be installed in local homes. Second and Third Grade collected items for comfort bags and a monetary donation for the Danville Cancer Society. They will make Valentine’s Cards for cancer patients as well. Fourth and Fifth Grade collected food and other essentials for God’s Store House. The Middle School collected a donation to create “blessing buckets” to help the disaster relief efforts of God’s Pit Crew. 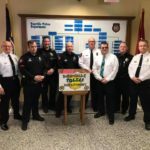 They plan to volunteer to assemble buckets at a later date.